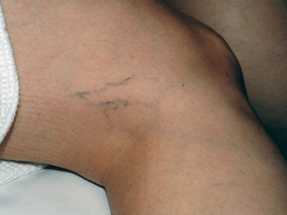 Thread Veins are extremely common and harmless but can be quite embarrassing. 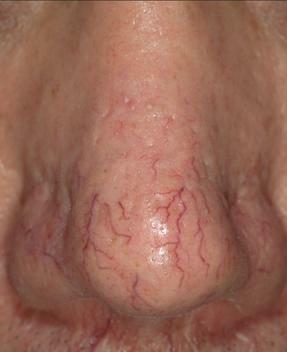 Thread Veins are commonly found on the face and legs. They are tiny superficial blood vessels near the surface of the skin, which can look different in colour from the surrounding skin. It is a common occurrence and does not cause any medical problems but are visibly noticeable and tend to increase in size and number as we age. The secret lies in the laser technology that delivers an intense, but gentle burst of energy onto targeted areas of the skin, delivering a controlled amount of therapeutic heat to the targeted area with proven and effective results. Thread Vein Removal treatment will remove spider fine veins and larger veins approximately 1-3mm in size. The unwanted veins are removed by emitting a safe laser light over these veins. Why use Ultra Peel Medical Microdermabrasion? *Requires less treatments than other Microdermabrasion systems. At the clinic we use the GentlePro Max which uses a patented Dynamic Cooling Device (DCD), which prepares the skin for treatment by spraying the upper layer with a cooling burst of cryogen in adjustable durations - milliseconds before the laser pulse. DCD helps ensure that the treatments are as comfortable as they are effective. Requires less treatment than other methods. Best results are seen with people who have fine veins of less than 2.5mm and untanned skin. 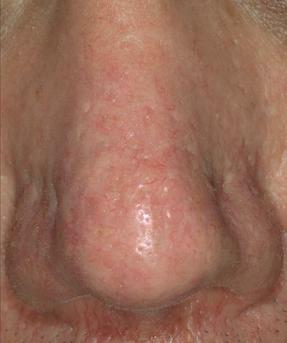 Face, chest and leg thread veins are usually the most suitable for treatment by laser. The laser uses brief pulses of laser to safely pass through the skin, the laser light is absorbed by the blood vessels, but not the surrounding skin, heating them to a point where the blood vessel coagulates. This causes the vein to break down. The damaged veins are gradually dissolved and removed, fading over 4-6 weeks after treatment leaving little or no trace of the original vein. Treatment will take place at the clinic. We use a small laser hand piece to deliver tiny pulses of laser light. A treatment could take as little as 15 min to a hour depending on the areas being treated. It shouldn't be. Laser destroys tissue by heat so you will not feel any burning or pain. Each pulse is less than a thousandth of a second and the laser only works on the unwanted vein leaving the surrounding skin and tissue safe. The sensation of the laser is often described as similar to a rubber band pinging against your skin, it only lasts at the time of the pulse and not lasting. Local anaesthetic cream can be used to increase comfort. Two or three sessions is usually all that is needed to leave your skin clearer, blemish free and smoother skin, however we recommend 4-5 sessions to give you the best long term results. Time between treatments are 6-8 weeks apart. There are no significant major preparations required for this treatment, but you will want to avoid sun exposure, aspirin, alcohol and smoking for at least a week prior to the procedure. On the day of treatment, avoid all creams, lotions and moisturisers on the area to be treated. Also wear comfortable clothing that allows easy access to the body parts being treated. After the treatment you can expect bumpiness like scratches across the lesion treated, it commonly disappears a few hours after treatment. The treated area may also appear redder and occasionally be bruised. A cooling gel is applied to increase comfort. The risks associated with laser vein treatment are very minimal. Protective eye wear will be used to protect your eyes during treatment. All of our aftercare products and state of the art cooling systems put you at very low risk of side effects and relatively pain free. What are the benefits of Thread Vein Removal? The most common benefits experienced from thread vein removal vary from client to client. The most common ones are, it really improves self confidence giving you more confidence to wear a wider variety of clothing. Its one of the fastest treatments available, clients like to have this treatment in a lunch break. Its more effective than other methods.